Friday, September 16, saw King Carl XVI Gustaf, Queen Silvia, Crown Princess Victoria, Prince Daniel, Prince Carl Philip, and Princess Sofia attend the Sweden Dinner at the Royal Palace, while Princess Madeleine was in New York. Victoria has been in New York this week but her trip doesn’t end until the 23rd, so I’m going to wait and throw her entire trip into one post. On Monday, February 2, Princess Madeleine and Chris O’Neill visited Gävle (Maddie is Duchess of Hälsingland and Gästrikland, where Gävle is located) where they met and had lunch with the Governor, Barbro Holmberg, and 40 guests from the county’s sporting culture and industry (including Prince Daniel‘s parents) at Gävle Castle. They also visited ESRI Group, the leading GIS (Geographic Information Systems) companies in the area, where they learned about GIS and ESRI’s collaboration with the University of Gävle. They then visited Helges recreation center, which offers a wide variety of activities to anyone who wishes to use the center (it’s open to all). Hot on the heels of an interesting conversation in the previous post’s comments about charity and whether the royal’s involvement in charity is worth anything, here’s a post on Princess Madeleine and Queen Silvia of Sweden in New York last week. Silvia and Madeleine are involved with charity that deals with child protection from violence and exploitation–Silvia created World Childhood Foundation and Madeleine works for Childhood USA–so they were in New York last week to attend a few events with the United Nations and Global Citizen. 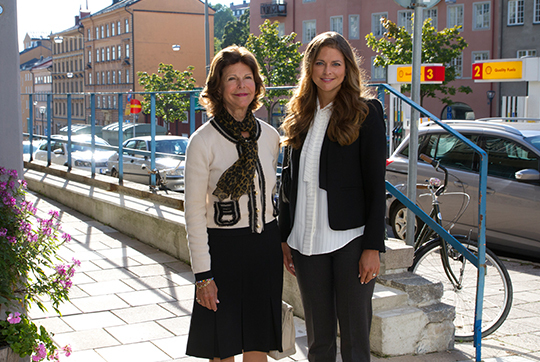 Princess Madeleine and Queen Silvia visited Ersta Child Rights Bureau on September 2 in Sweden. They met four young people about their experiences with the Child Rights Office and how they helped the young people and supported them in contacting the authorities. Child Rights Office is involved in ensuring children’s rights are not violated and offers children and young people support and advise.